Everything about Venice is sumptuous and extravagant: its history as a wealthy and powerful maritime republic; its architecture, which spans from the Byzantine Saint Mark’s Basilica to the Gothic palazzi lining the Grand Canal; its art, dominated by the eye-popping colors of Renaissance masters Giorgione and Titian. 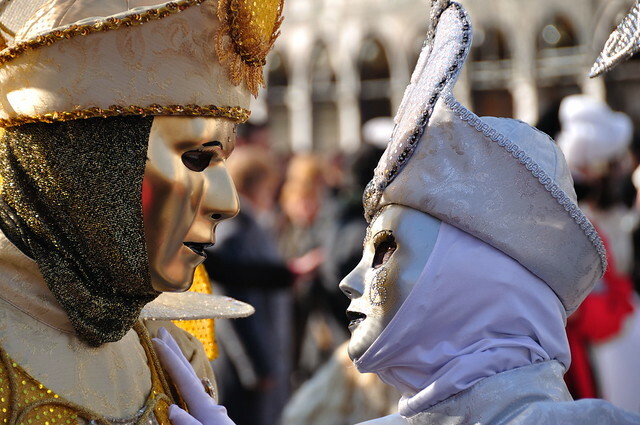 Is it so surprising, then, that even Venice’s Carnival celebrations are the most elaborate in all of Italy? 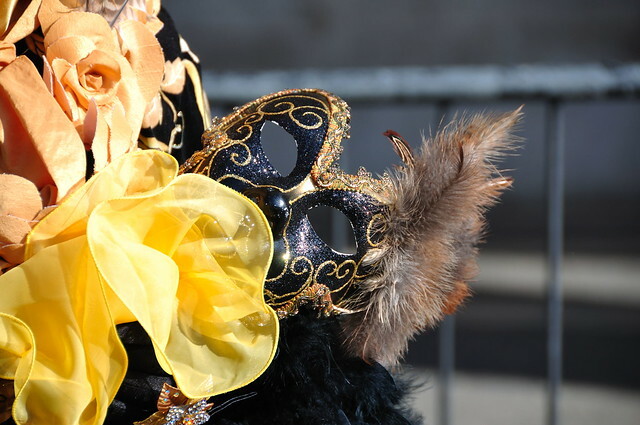 Carnival is the month-long festival which culminates in the “Fat Days”–from Shrove Thursday (Giovedì Grasso) through Shrove Tuesday (Martedì Grasso) preceding Ash Wednesday, which ushers in the forty day period of Lent (La Quaresima) leading up to Easter Sunday. As the annual dates of Carnevale depend upon when Easter Sunday falls, the festival varies from year to year, though always includes some or all of the month of February. Though the festival has roots in pagan traditions, Carnival was co-opted by the Christians as the influence of this new religion spread, and in many parts of Italy evolved into a swan song of bacchanalian and carnal overindulgence before the Lenten period of penitence and purifying deprivation. And in no part of Italy was this overindulgence more bacchanalian and carnal than in Medieval Venice. Tweetable: Carnevale ends on March 4th this year, so there are still a couple of weeks to enjoy the festivities in Venice. Il Carnevale di Venezia was for centuries the most famous Carnival celebration in the world, and possibly began as a public celebration of a military victory in 1162 which happened to fall during the Carnival season. 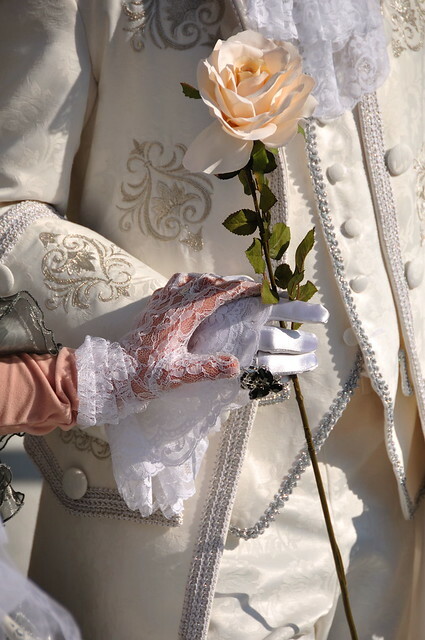 As the centuries passed, Venetian costumes and festivities became increasingly elaborate, culminating in the sumptuous Baroque style that has been maintained (with a brief hiatus during the Austrian occupation at the end of the 1700s) until today. 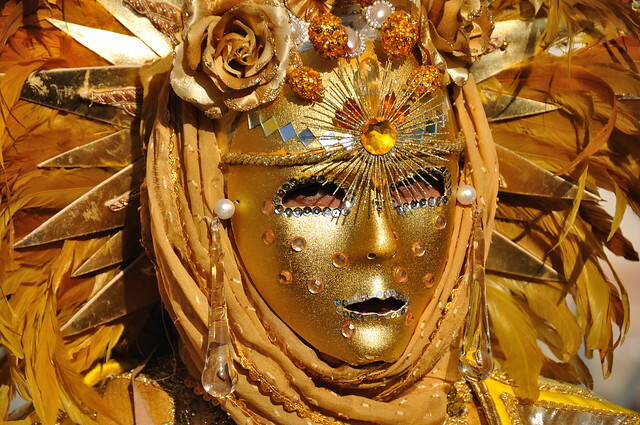 One of the central focuses of Venice’s Carnival are the maschere, or costumed characters, and the focal point of each costume is its elaborate mask. The city of Venice has a long tradition of mask-wearing, which was a way for the noble (and not so noble) citizens of La Serenissima to indulge in the city’s vast offering of vices without fear of being recognized. Mask wearing became such a problem for public order that by the 1700s masks were forbidden outside of the period of Carnevale. Venetian masks today come in an endless variety of materials, shapes, and decorations, but traditionally masks were limited to a few standard styles to maintain the wearers’ anonymity. The Bauta is the most traditional of Venetian masks, characterized by the large nose and prominent eyebrow ridge and chin, the beak-like shape of which allows the wearer to eat and speak without removing it. To complete the anonymity of this gilded (though traditionally stark white) mask, the accompanying costume included a red or black floor-length cape and a tricorn hat. This disguise was so complete that it became obligatory during the 18th century for certain political functions, performing the same function as a secret ballot does today. Another common mask is the Columbina, an elaborately decorated half-mask held up with a baton or fastened to the head with a ribbon and covering only the wearer’s eyes, nose, and upper cheeks. It is most commonly used by women, complementing the traditionally masculine Bauta. Two other iconic masks that are often seen during Venice’s Carnevale celebrations are the Medico della Peste, with its round eye-holes and long, hollow beak-like nose, worn with a black cloak, white gloves, and a walking stick, and the stark white Volto, which covers the entire face with its fixed facial features of eyes, nose, and mouth. Today the Volto is often gilded and elaborately decorated, and worn with a cape and tricorn. 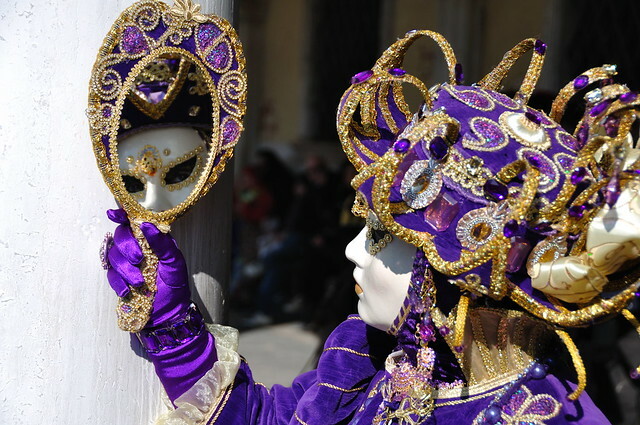 Tweetable: Though Venetian masks are elaborately decorated today, traditionally they were stark white and identical to preserve the wearer’s anonymity. Since the 1980’s, Venice has been promoting its traditional Carnevale celebrations as part of the city’s cultural heritage and during the weeks preceding Ash Wednesday the campi and calli of Venice are filled with costumed characters, live music and entertainment, sinful Carnevale sweets, and a general atmosphere of benign anarchy. The popularity of Venice during Carnival means that you need to plan ahead if you’d like to visit--especially as the weekend preceding Shrove Tuesday approaches—to be able to fully participate in the festivities. There are elaborately costumed characters milling across the city and public entertainment (including music, costume pageants, and fireworks) is offered in Piazza San Marco and the surrounding Sestieri, so there is plenty to see and do by just wandering the streets. 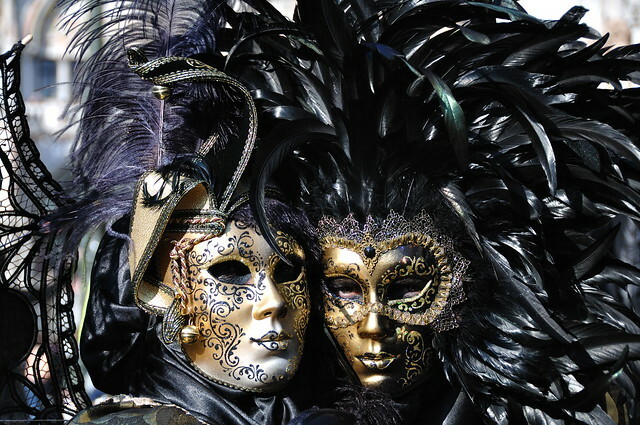 Tweetable: The most memorable way to celebrate Carnevale in Venezia is at a private masquerade ball in costume!